The global market for peptide therapeutics has been witnessing a substantial rise in its size and valuation since the last few years. The major factors that are driving the growth of this market are the rising prevalence of metabolic disorders and the increasing pool of cancer patients. The technological advancements, resulting in a significant reduction in the production cost of peptide drugs, is also boosting this market remarkably. The rise in research activities and development pipeline of peptide drugs is projected to bring significant growth in this market over the next few years. However, the high complexity of peptides may obstruct the manufacturing of peptide drugs over the forthcoming years, reflecting poorly on the overall progress of the market. In 2015, the worldwide market for peptide therapeutics was worth US$21.3 bn. Researchers project the opportunity in this market to expand at a healthy CAGR of 9.10% between 2016 and 2024 and reach a value of US$46.6 mn by the end of 2024. 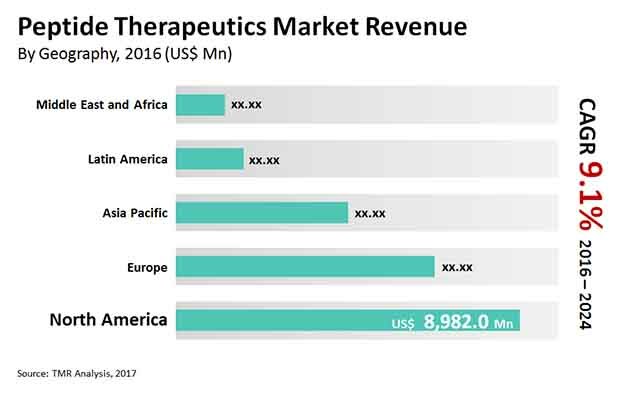 Based on the application, the global peptide therapeutics market is classified into cancer treatment, drugs for metabolic disorders, cardiovascular disease (CVD) therapeutics, respiratory disorder therapeutics, gastrointestinal tract (GIT) therapeutics, anti-infective drugs, dermatology therapeutics, central nervous systems (CNS) therapeutics, and renal therapeutics. With peptides evolving as a potential therapeutic agent for the treatment of cancer, the cancer segment emerged as the key contributor to this market in 2015. The rising mortality rate, caused by cancer, has led to an increased focus of players towards the development of new drugs and products to combat the situation, which is influencing the market substantially. The technological advancements and extensive research and development activities are likely to fuel the uptake of peptide therapeutics for the treatment of cancer over the next few years. Peptide therapeutics mainly follow two routes of administration: Oral and parenteral. The parenteral segment led the global market for peptide therapeutics in 2015 due to the easy availability of peptide drugs for the parenteral route of administration compared to other routes. However, the oral administration of these drugs is likely to increase significantly over the next few years. Geographically, the worldwide market for peptide therapeutics has been segmented into North America, Europe, Asia Pacific, the Middle East and Africa, and Latin America. North America led the global market with a share of 38.8% in 2015 and is expected to maintain its dominance over the next few years. The advancements in the healthcare infrastructure and the advent of peptide therapeutics as a highly potent drug used in oncology and hormonal therapies are likely to boost the growth of the North America peptide therapeutics market in the near future. Apart from this, the presence of well-established players in the U.S. is also projected to support this regional market over the forthcoming years. Europe, which stood second in 2015, is also anticipated to witness healthy growth in the years to come. The global peptide therapeutics market is extremely consolidated in nature. At the forefront of this market are Teva Pharmaceutical Industries Ltd., Takeda Pharmaceutical Co. Ltd., Sanofi, Pfizer Inc., Novartis AG, GlaxoSmithKline Plc, F. Hoffmann-La Roche Ltd., Eli Lilly and Co., Bachem Holding AG, and Amgen Inc.
Market revenue is provided in terms of US$ Mn from 2014 to 2024 along with the compound annual growth rate (CAGR %) from 2016 to 2024 for all the segments, considering 2015 as the base year. The executive summary of the report provides a snapshot of the peptide therapeutics with information on leading segments, country wise market information with respect to the market size, growth rate (CAGR %), and growth factors. Moreover, the report also includes pricing analysis for the major peptide drugs worldwide. The market overview section comprises impact factors such as drivers, restraints, and opportunities for the global peptide therapeutics market. These factors would aid the stakeholders in establishing a strong foothold in the global peptide therapeutics market. Furthermore, the market overview section comprises key industry events, product overview, market attractiveness analysis and emerging trend in the peptide therapeutics market. The market attractiveness analysis provides a graphical view comparing the growth and market dynamics in various segments and country wise to identify the most attractive market. The peptide therapeutics market has been segmented as by application, by route of administration, by type, by technology, by type of molecule, by API peptide type and by geography. Based on application, the market has been segmented into cancer, metabolic, CVD, respiratory, GIT, anti-infective, dermatology, CNS, renal and others. Based on route of administration, the market has been segmented into parenteral, oral and others. Based on type, the market has been segmented into innovative and generic. Based on technology, the market has been segmented into liquid phase, solid phase and hybrid phase. Based on type of molecules, the market has been segmented into vasopressin, somatostatin, calcitonin, immunopeptide, natriuretic and others. Based on API peptide type, the market has been segmented into in-house and CMO. Geographically, the peptide therapeutics market has been categorized into North America, Europe, Asia Pacific, Latin America, and Middle East & Africa. Moreover, analysis for the major countries comprising U.S. Canada, Germany, U.K., France, Italy, Spain, Rest of Europe, Japan, China, India, Rest of APAC, Brazil, Mexico, Rest of LATAM, South Africa, Saudi Arabia, Rest of MEA have also been provided in the report. A detailed qualitative analysis of the factors responsible for driving and restraining the growth of the peptide therapeutics market in various regions has been provided in this section. It also includes various ups and downs about particular country or geography that has impacted the overall market globally. The report provides a detailed outline/blueprint of the peptide therapeutics market globally that will assist new companies in establishing their presence and market players in expanding their market share in the market. It concludes with the company profile section which includes company overview, financial overview, SWOT analysis, product portfolio, business strategies and recent developments for market players. The major players that are profiled in the report include Sanofi, Teva Pharmaceutical Industries Ltd., Novo Nordisk, Eli Lilly and Company, F. Hoffmann-La Roche Ltd., GlaxoSmithKline plc, Pfizer, Inc. and others.